Leather was an extremely common material in medieval times, far more pervasive than it is now. It was used for shoes, belts, purses, cases, armor, clothing, horse tack and saddles, bags, and more. Some leather items were plain and utilitarian, while others were highly decorated, with embossing and other leather “carving” as well as cut outs, dying, painting, and even gilding. Purses especially used metal mounts for decoration. Only the poorest went without shoes in the Middle Ages. There were many styles and, like styles in most clothing items, their popularity waxed and waned, sometimes even falling out of use. As with many things, those for the rich were richer in materials, workmanship, and decoration. 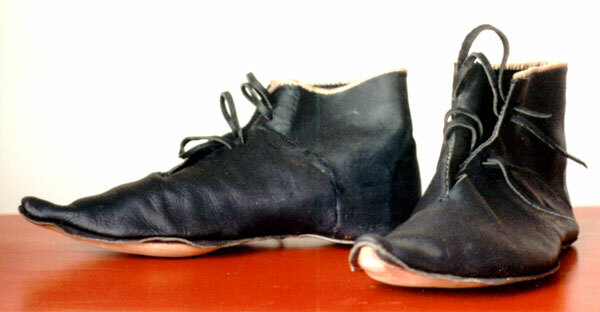 Medieval shoes are of “turn shoe” construction. This means that they are sewn together inside out, then the finished shoe is “turned” so that the intended outside is actually outside. This helps protect the stitching. The longer the stitching lasts, the longer the shoe lasts. 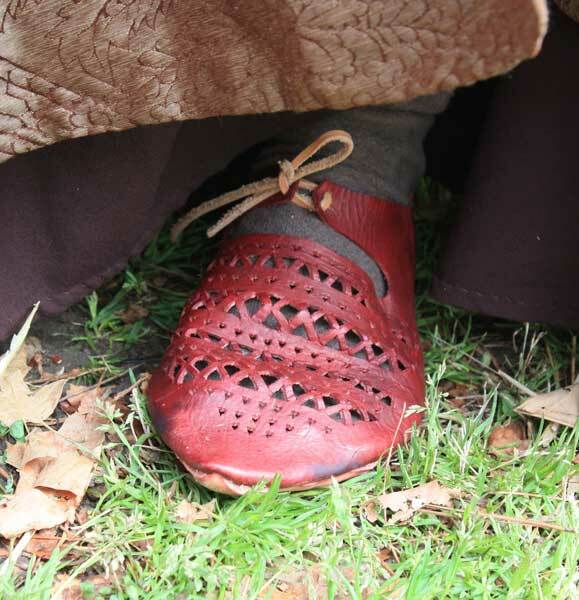 The solid core of our information on shoes comes from the Museum of London’s book Shoes and Pattens by F. Grew and M. de Neergaard with additional material from Olaf Gubitz’s Stepping Through Time, but individual finds hold important data points. This is a common style for the late fourteenth century and into the fifteenth. To the right is a pair made for Sir Geoffrey, to wear with his armor. Not visible in this picture are the holes near the toes through which pass the points for tying down the tips of his armored sabatons. The uppers are black to hide the oil and rust stains. The lovely pale topbands you see around the ankle hole have come to blend with the rest of the shoes due to exactly those stains. Recently the shoes have been clump soled, extending their life. Sir Geoffrey’s shoes, like almost all of our shoes, are sewn over a last, a wooden form that helps shape the leather while providing a solid surface during sewing. The pair of shoes to the left is a “low-cut” style, common in the late fourteenth century but not particularly suited to the outdoor life since they tend to pick up stones and scoop them down under your feet. This is a style we do not encourage as a choice for commoners. This style is rare in the early part of out period and does not become really common until the fifteenth century. It seems to have been a choice for men who expected to spend a good deal of time outdoors, being especially popular with huntsmen. Experience has shown use a version of this style makes an excellent shoe for wearing beneath sabayons and closed greaves as the tight fit over and above the ankle nestles well under the steel while providing a good resistance to chafing from the metal. 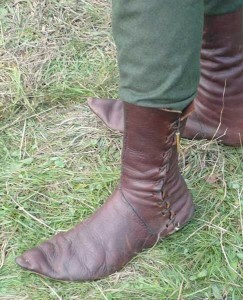 High boots, so popular with re-enactors, seem to first appear around 1400, where they are seen on riders — and only on riders. The style does seem to grow slowly in popularity but they also seem to remain strongly associated with riders. Standards are leather cases for carrying goods. These are hypothetical reconstructions based on manuscript illustrations and on and the construction of much later leather cases. This medieval pictures show rounded, brown-colored objects with straps and buckles. The color strongly implies leather as the material. We tried to match the silhouette we saw in the pictures. What medieval people put in them, we don’t know – it’s hard to use X-ray vision on a manuscript illustration. We use them to carry Sir Geoffrey’s armor, since the leather is a negligible weight to add to the weight of the armor itself. Documentary sources suggest that chests were a way to store armor, often being bought in pairs for a gentleman, but the wood in chests are more weight. Modernly, “purses” seem toy be confined to the ladies. In the Middle Ages, however, both sexes wore purses. What is nowadays called a girdle purse (for the way it was worn on the girdle, or belt) seems to have been almost or completely exclusively an item for males. The classic form has two loops, through which the belt passes and one or more “bags” suspended from those loops. Usually there is a strap involved in some way to secure the opening. We spent years working with the fragmentary information from the London finds in the Museum of London’s Dress Accessories by Scott, M. A more recent publication from the estimable Olaf Goubitz, Purses in Pieces, documents many complete and nearly complete specimens recovered in the Netherlands. The reconstruction on the left is a simple model with a single bag. Although it does sport a metal mount, that mount is of pewter, the lowest grade of decorative metal. 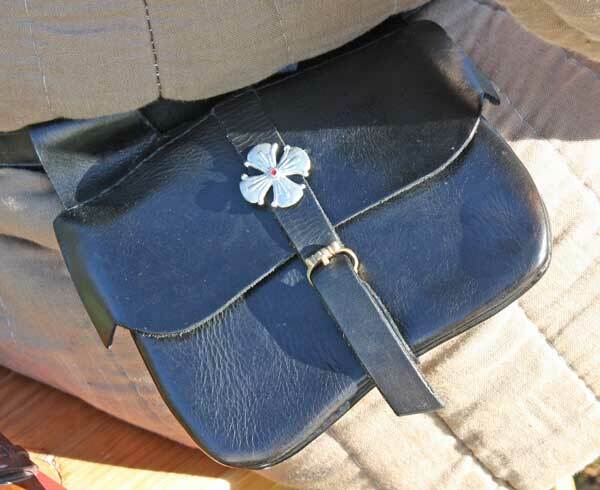 The strap passes over the flap and is secured with a buckle. That buckle is copper alloy, much sturdier than pewter, but more costly. the net effect is that this purse suggest a man of some, but not great, means.